Last month, we looked at the large-scale aspects of the planetary geology of the Moon, the kind of thing that amateur astronomers can see through small telescopes under just about any light pollution conditions. Two principal features we can see on visible side of our nearest neighbour in the Solar System, apart from the heavily cratered terrain, are : light coloured highlands and dark coloured lunar Mare, or “Seas”. The light coloured material formed when crystals of the lightweight mineral feldspar floated to the top of a Moon-wide magma ocean, and the dark material formed when basalt lavas erupted into the giant Basins that had formed by large impacts about a billion years previously. Lunar Valleys come in two varieties : straight and squiggly ! The straight ones are usually interpreted as simple rifts, which means that most planetary geologists think they result from the walls of the valley being pulled away from each other, and the valley floor dropping into the resulting space below. Here’s a nice example called the Sirsalis Rill. It’s very long - about 450 km in all - and the black arrows indicate how the rift walls moved apart. However, it’s not very easy to see from Earth. This example, Hyginus Rill, is much easier for amateur telescopes. Note the jog in this valley just left of where it crosses the Hyginus crater. It’s really made up of 2 separate straight segments. Here’s a close-up on the Ariadaeus Rill. Note the off-set of the two segments of this straight rill inside the white circle. The point here is that, although these straight valleys are supposed to be “simple”, they’re not as simple as suggested by the rift model. The really interesting valleys are the squiggly ones, like this example in the Alps on the North side of the Mare Imbrium. In the large circle you can see a continuous squiggly valley, but it seems to feed into a chain of holes and short “squiggly valley” segments in the smaller circle. These features are interpreted as ancient lava rivers. The general idea is that very hot, runny lava (komatiite) was able to flow over the lunar surface for long distances before it froze. When it froze, it froze on the outside first, forming a long, skinny tunnel that still-molten lava could continue to flow through. The chains of holes and the squiggly segments are interpreted as the beginnings of collapse of the empty lava tunnel long after the molten lava had stopped flowing through it, and the long open squiggly valley represents the stage where the entire lava tunnel roof has collapsed (but where’s the debris?). Where was this lava flowing to ? This image of Schroter’s Rill shows you that it was flowing from the point of eruption in the Highlands and onto the floor of the western part of the Mare Imbrium. This is probably the easiest squiggly valley for amateur telescopes - and it represents good observational evidence that the dark material covering the Mare floors is indeed lava, and you can see it for yourselves ! The most famous of all lunar valleys is the Alpine Valley that cuts across the Alps on the northeastern side of the Mare Imbrium. Most people think of it as a straight valley and interpret it as a rift, and they’re probably right. However, if you look carefully at this image, you’ll see that there is a squiggly lava tunnel running all the way down the length of the rift. Tis tunnel must have channeled flowing lava from one Mare to the other, but I’ve no idea which way ! Although the Alpine Valley is very easy to see when the shadows are just right, I don’t expect to be able to see the lava tunnel with any amateur telescope, but I may be wrong. There are two more linear features you can easily see on the lunar surface with amateur telescopes : scarps and ridges. Scarps are cliffs or steep slopes that form when a large fault reaches the lunar surface, and the ground on one side drops down with respect to the other side of the fault. The most famous example of this is the Altai Scarp that runs parallel to - and faces towards - Mare Nectaris (which is to the NE). Apparently it represents a segment of the circular ridges that formed at the moment of impact that formed the original Nectaris impact Basin. This cliff is gigantic, rising to an average of 1.5 km high, and locally up to 4 km high … now that’s big ! Another very well known example is the Straight Wall that faces toward the Mare Nubium. However, because it is so straight, it is probably a late fault scarp that formed long after lava filled the original impact basin. Ridges are rather like low, rounded scarps that occur in the margins of Mare. Traditionally they are interpreted as scarps related to the original impact Basins that have been flooded by the Mare lavas, and in many cases this is probably true. However, look at these examples from the SE corner of the Mare Humorum. Instead of being continuous, they seem to be made of off-set segments. Notice 2 more things : #1: there are several craters that lie right on the trace of some of the ridges indicated by the black arrows - anyone who plays darts or golf will know what a coincidence that represents ! #2: the Sun, which is shining from the right, is illuminating the ridges, which must therefore either be symmetrical, or they must be scarps that faced towards the exterior of the Mare Humorum - but scarps related to impact Basins should face inwards towards the excavated hole ! I may be wrong, but in this particular example the ridges look to me like late faults that have channeled lava from deep down - molten rock that has reached the surface as volcanic craters located along the fault network. lJust to push the point home, here are some more ridges from the Mare Serenitatis. Note the complicated segmented intersection pattern they make with the Sun illuminating the ridges from the right, and the small, clean-cut craters that lie along the ridge tops that you can see inside the circle. I think these have to be fault ridges that are younger than the Mare lavas, but that must’ve formed early enough in the Moon’s history for volcanic activity to still be possible. Again, while you might see the ridges through your telescopes, I doubt you will be able to see these small craters - but you never know ! 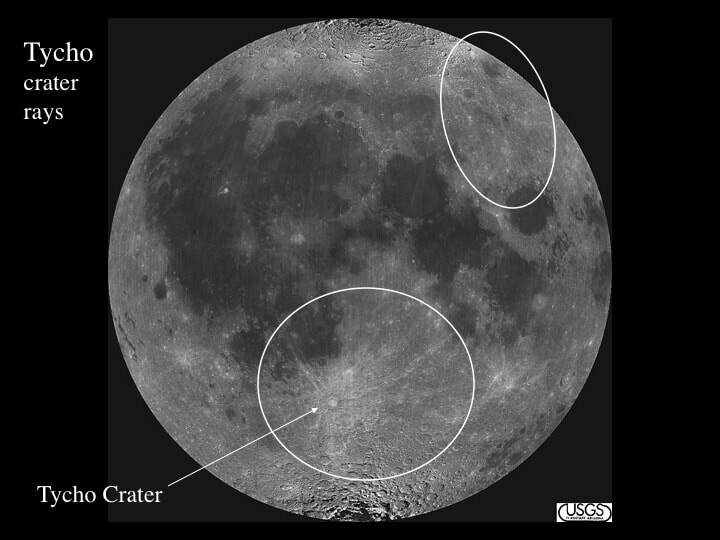 Finally, there are other linear features that radiate out from some impact craters extending, in some extreme cases, half-way round the Moon. These represent debris ejected from the craters at the moment of meteorite impact. Any land forms that are crossed by the streaks of ejected material must be older than the crater that the streaks originated from. The two best preserved examples are the Copernicus and Tycho craters. Here you can see the light coloured streaks radiating out from Coperrnicus. Notice the train of small craters and irregular shaped holes ringed in white that were made by larger blocks of ejected material. This crater formed about 1 billion years ago. Here’s Tycho. In this photo you can only see one of the rays of debris in the northern hemisphere, but in fact there are more crater rays in the West that you can see in your telescopes, crossing all of the Mare and demonstrating that Tycho is the youngest large impact crater on the lunar surface. In fact, Tycho formed only ~100 million years ago - when the dinosaurs were still in their prime ! In theory, nothing much has happened on the Moon since Tycho, although there have been a number of claims during the 20th century of sightings of flashes that people have tried to attribute to volcanic eruptions or to impacts. 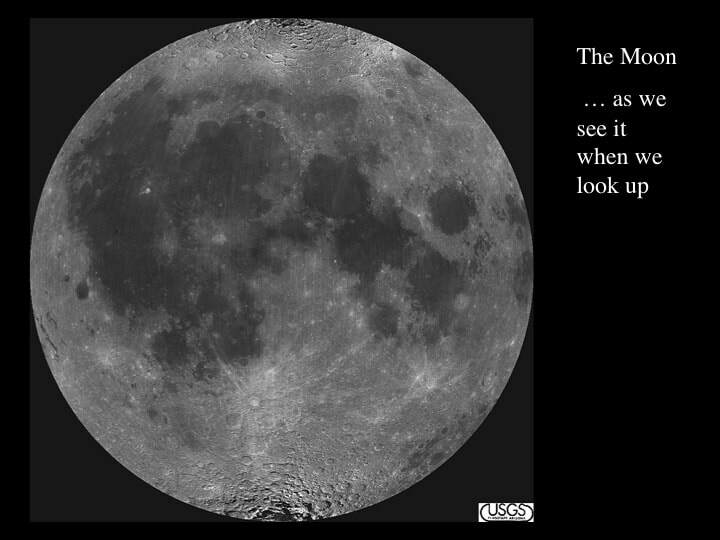 Make the most the Moon’s proximity to Earth to directly observe for yourselves the evidence for its geological history … and bear in mind that you’ll be observing phenomena very similar to those that have shaped the other rocky planets of our inner Solar System.